All actions in CET.In the battle group line after 4 König class of the VI Division, III Battle Squadron, followed by the Kaiser class of the VI Division, III Battle Squadron undamaged after Jutland. She sailed behind. at 17:46 Scheer gave the Open Fire signal to Kaiser, Kronprinz, Friedrich der Größe and the battleships of the I Squadron.17:48 - 17:52 engaged the 2nd LCS. IN 8 minutes Kaiser fired 11 salvoes at Southapton without success. At 17:58 Scheer ordered an increase in speed which caused a split between the Konig and the Kaiser class ships. At 18:05 Kaiser fired four more salvoes at Southampton, again without success. 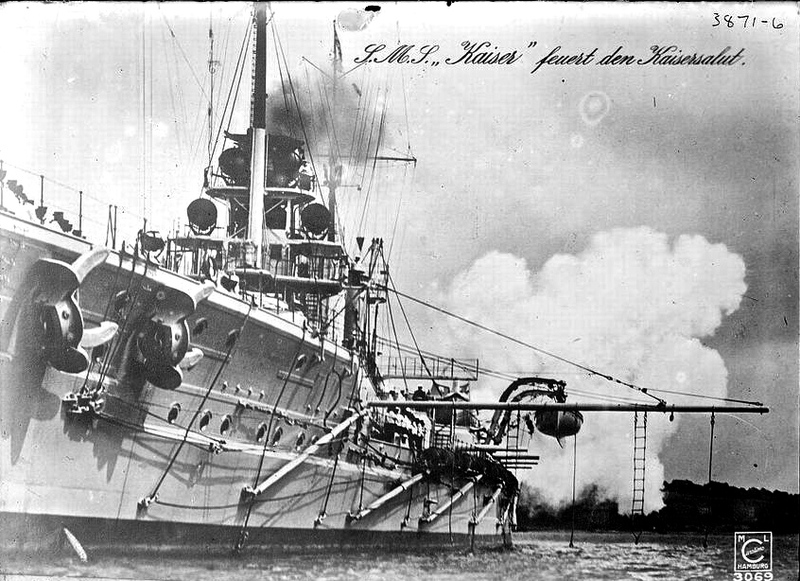 Joined in the firing on the Nomad which sank by the stern at 18:30 (Nestor was destroyed by ships of the I Squadron). 18:10 opened up on the Malaya and in twenty five minutes fired 27 salvoes at an average range of 17,000 yards. At 20:15 Sheer turned away for the second time with Kaiser now fifth in the line. At 20:23 Kaiser was hit with two heavy calibre shells and again at 20:26. The 13.5" CPC shells came from Agincourt. At 21:30 British light forces were spotted approaching the line. Calliope was badly damaged as the fire was opened at around 8,000 yards. In the night steaming, Kaiser took the 12th ship in the line of 24 ships headed by the ships of the I Squadron. 3 shaft Parsons turbines with top service rating of 31,000 shp. Ran a full knot faster than her sister ship, Friedrich der Größe.